TORONTO, October 19, 2017 /3BL Media/ - Companies are increasing their impact in community through program designs that reflect the UN 2030 Sustainable Development Goals. 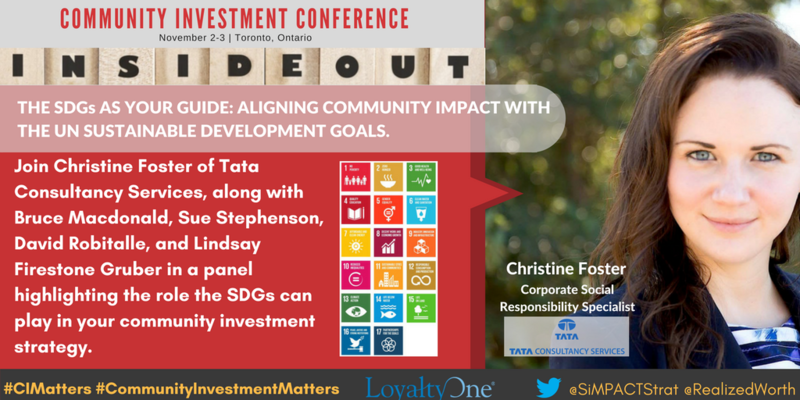 Christine Foster, Tata Consultancy Services, will share her experience in strategizing through an SDG lens. She will be joined by colleagues from IBM, IMPACT2030, the Taproot Foundation, and Imagine Canada. This knowledge-sharing will occur November 2-3, 2017, at the upcoming Toronto conference Inside Out: A Transformative Approach to Community Investment. Inside Out is designed to advance the practice of how companies invest in community. Currently, companies are seeking a clear return on investment (ROI) through community activities. Recognizing this, the Inside Out conference will explore how business priorities such as diversity and inclusion, employee wellness, and employee engagement can be advanced through community investment. An Inside Out approach builds the skills and knowledge needed for clear and sustained impact: in community, upon employees, and across the company. "Inside Out is designed for companies seeking to impact community in meaningful ways," says Stephanie Robertson, CEO & Founder of SiMPACT Strategy Group. "This way of thinking encourages focus upon the skills, talents and ambitions of employees inside the organization and how they can be directed to impact opportunities outside the organization, in community. Many companies don’t yet realize that some of their programs already align with the SDGs. Adding the SDG lens to planning can really enhance impact." Christine Foster, Corporate Social Responsibility Specialist, Tata Consultancy Services, has been working to align Tata's community strategy with the UN Sustainable Development Goals. David Robitaille will share IBM Canada’s perspective, Lauren Firestone Gruber will offer insights from the Taproot Foundation and Sue Stephenson will share IMPACT2030’s work in encouraging companies to respond to employee interest in the SDGs. Non-profits considering the SDGs as an opportunity to create new partnerships can look forward to comments from Bruce McDonald, CEO, Imagine Canada, who will tease out this new opportunity as the panel moderator. Community investment has a role to play in addressing vital corporate priorities. Join Canadian and international peers on November 2-3, in Toronto. Think Inside Out. For more information, please call Arundel Gibson at (416) 642-5461. Or visit: https://www.lbg-canada.ca/news/conference/. LBG Canada is a network of professionals guiding community investment, CSR and social engagement strategies on behalf of many leading companies. Each year, the LBG Canada network assembles for the purpose of advancing the practice of community investment through information sharing, peer-led discussion and data analysis. For more information on LBG Canada, please visit: www.lbg-canada.ca. Realized Worth is a global consulting firm offering design and implementation support for employee volunteering programs. Now, Realized Worth offers an online learning platform that focusses on empowering the leadership of employees to grow and scale programs through training and certification. For more information on Realized Worth, please visit: https://www.rlzdwrth.com/who-we-are. Inside Out will be hosted by LoyaltyOne, within the new, state-of-the-art Globe and Mail Centre in Toronto. Located in the emerging hub of urban activity and corporate head offices on King Street east of Sherbourne Street, the 500,000 square foot, 17-storey office tower targeting LEED® Gold was designed by award-winning Toronto architectural firm, Diamond Schmitt Architects. The Globe and Mail Centre is within walking distance of the Distillery District, St. Lawrence Market, Toronto’s Waterfront, Union Station and other modes of transportation. Just minutes from the downtown core, The Globe and Mail Centre offers elegant spaces with panoramic city and lake views.